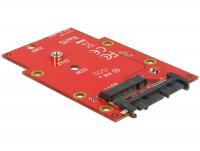 This M.2 NGFF module by Delock expands your system by two internal SATA 6 Gb/s connections with SATA interface. The module supports RAID 0,1. 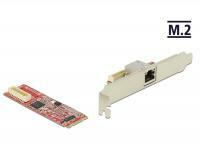 This M.2 NGFF module by Delock expands your system by four internal SATA 6 Gb/s connections via PCIe 2.0 interface. 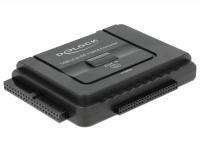 This adapter by Delock enables you to connect a 2.5â³ IDE hard drive to a 3.5â³ 40 pin IDE controller. Simply plug the adapter into your hard drive and connect it with an existing IDE 40 pin cable and a free 4 pin Molex connector of your power supply. 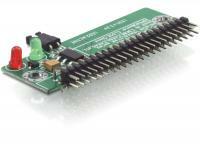 This converter by Delock enables you to convert the interface of your IDE drives into SATA and the interface of SATA drives into IDE 40 pin. 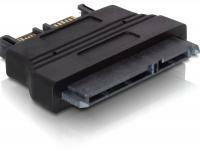 This adapter by Delock enables you to connect a 1.8â³ HDD with Micro SATA 16 pin interface. Afterwards you can connect the adapter to your power supply and your motherboard, by using optional connection cables. 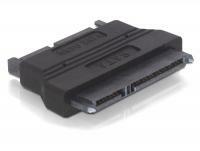 This adapter by Delock enables you to connect your CD / DVD drive with standard SATA 22 pin interface to 13 pin Slim SATA. 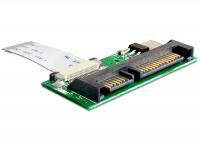 This adapter by Delock enables you to connect your CD / DVD drive with standard SATA 22 pin interface to 16 pin Micro SATA. 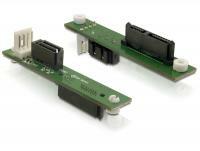 The Delock converter enables the connection of a SATA device to the IDE interface. 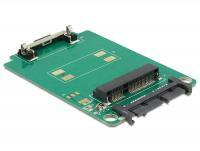 This internal converter can be connected to a ZIF port in order to connect a Secure Digital memory card. The memory card works as an additional storage as well as a HDD on which you can e.g. install an operating system from which you can boot. 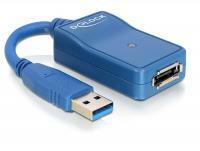 The adapter enables you to connect all SATA devices via USB 2.0 to your PC or notebook. This is a simple and favorable solution in case your computer does not possess a SATA port yet. 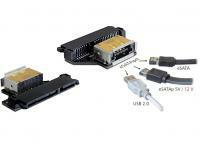 The eSATAp port enables a direct connection of a 2.5â³ SATA HDD, by using an optional Delock Power Over eSATA cable. 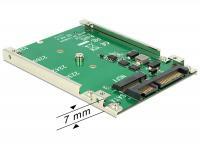 This Delock converter, with size of a 2.5â³ HDD, enables the connection of an mSATA module with half size format. 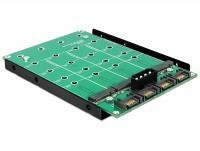 It can be integrated to your system through an internal SATA 22 pin port. 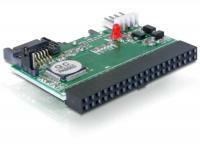 The Delock converter enables the connection of IDE devices like hard disks or IDE drives to the SATA interface. 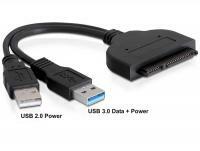 The adapter enables you to connect all external eSATA devices via USB 3.0 or USB 2.0 to your PC or laptop. This Delock converter can be connected to your PC or laptop via USB port and enables the connection of HDDs, SSDs and other drives with SATA 22 pin interface. The included power supply provides power for the adapter and the connected drives. This converter can be connected to a free USB port of your PC or notebook, in order to operate SATA devices like 2.5â³ / 3.5â³ SATA HDD, SATA Slim drives, Micro SATA 1.8â³ HDD / SSD. 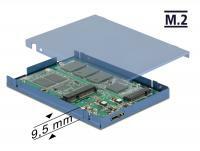 This Delock converter, with size of a 2.5 HDD, enables the connection of an mSATA module. 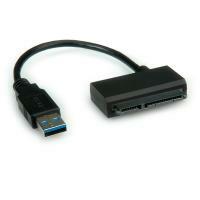 It can be integrated to your system through an internal SATA 22 pin port. 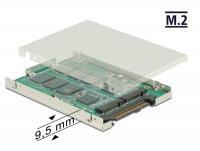 Furthermore you can install a half size mSATA module, by using the optional Delock adapter 65228. This Delock converter can be connected to your PC or laptop via USB port and enables the connection of HDDs, SSDs and other drives with SATA 22 pin interface. 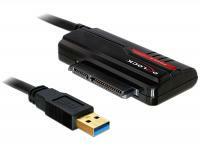 The connected SATA devices use the full USB 3.0 speed, if they are SATA 6 Gb/s specified. 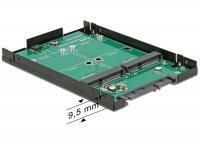 The included power supply can be used for 3.5â³ SATA HDDs or optical drives. 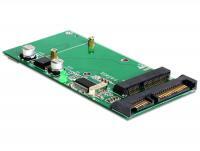 This Delock converter enables you to connect a mSATA SSD in half size or full size format which can be used as a 2.5â³ HDD. 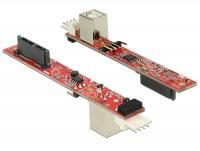 The converter can be installed into your system internally through a SATA 22 pin interface. 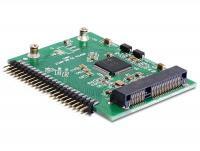 This Delock converter enables you to connect your 2.5 IDE devices e. g. HDDs to the SATA interface. 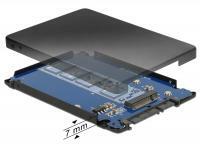 The Delock converter with the shape of 3.5â³ HDD enables the connection of a mSATA SSD over the SATA 22 pin port. 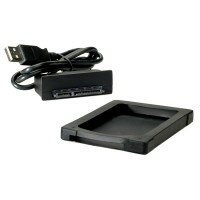 With the included metal frame you can insert the converter like a 3.5â³ HDD to your system. 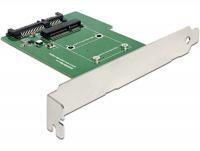 This Delock converter enables you to connect a LIF HDD through a SATA 22 pin interface to your system. This Delock converter enables you to connect a MacBook Air SSD through a SATA 22 pin interface to your system. 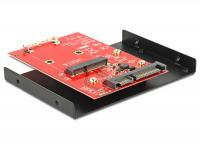 This Delock converter enables you to connect a mSATA SSD in half size or full size format. 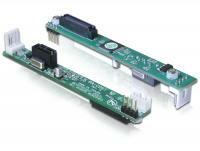 The converter can be connected to an internal SATA port and can be installed into a free slot of your PC. 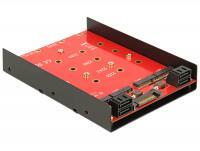 This Delock converter enables you to connect a mSATA SSD which can be used as a 2.5â³ HDD. 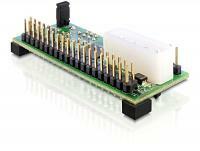 The converter can be installed into your system internally through a IDE 44 pin interface. 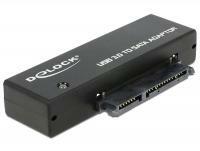 This converter by Delock enables you to convert the interface of your IDE drives into SATA or the interface of SATA drives into IDE 40 pin. The Delock SATA RAID converter enables you to build a RAID system with two HDDâs, as you connect the 22 pin SATA connector to the primary hard disk and connect the second hard disk to the SATA 7 pin device connector. By the second SATA 7 pin connector you embed the converter in your system. 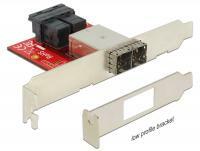 The Delock Backplane adapter can be connected to a SAS HDD and supports Hot Swap, Dual-Porting (Active-Active-Mode) and channel bundling with SAS HDDs. 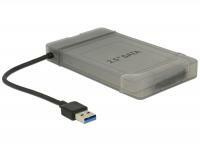 The adapter can also be used with SATA HDDs. 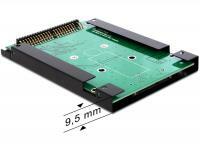 This Delock converter enables you to connect a mSATA SSD in half size or full size format which can be used as a 2.5â³ HDD. 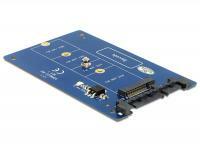 The converter can be installed into your system internally through an IDE 44 pin interface. 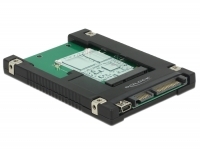 This Delock converter enables you to connect up to two mSATA SSDs in half size or full size format which can be used as a 3.5â³ HDD. 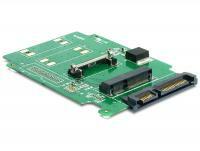 The converter can be installed into your system internally through the SATA interface. 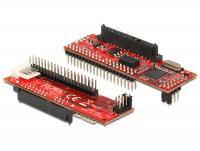 This Delock converter enables you to connect a IDE 44 Pin SSD / HDD by using the included IDE cable. You can install the converter into a free slot of your PC and connect it internally to a free SATA port. This Delock converter can be connected to your PC or notebook via USB port and enables the connection of HDDs, SSDs and other drives with SATA 22 pin interface. 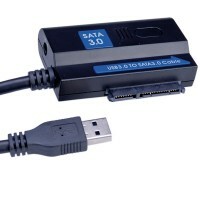 The connected SATA devices use the full USB 3.0 speed, if they are SATA 6 Gb/s specified. 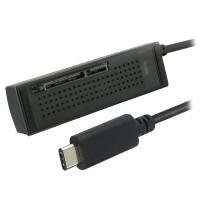 The included power supply can be used for 3.5â³ SATA HDDs or optical drives. 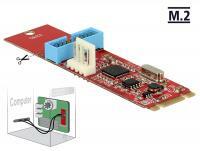 This Delock converter enables you to connect a mSATA SSD. 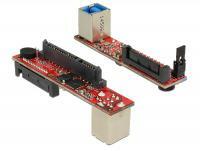 The converter can be installed into your system internally through a SATA 22 pin interface or via USB. 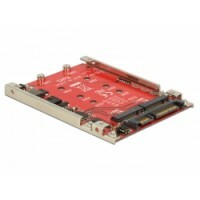 This Delock converter enables you to connect up to two MacBook Air SSDs through the SATA interface to your system. 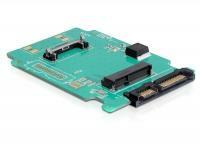 This Delock converter enables you to connect a mSATA SSD in full size format which can be used as a 2.5â³ HDD. 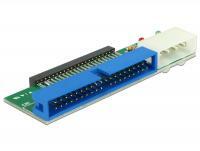 The converter can be installed into your system internally through an IDE 44 pin interface. 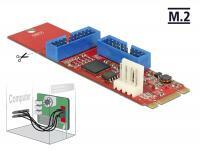 This Delock converter enables you to connect an mSATA module. 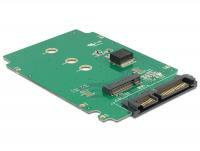 The converter can be installed into your system internally through an SATA 7 pin interface. 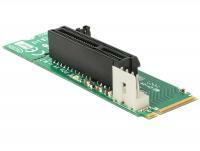 This adapter by Delock converts the M.2 NGFF interface into a SATA 7 pin interface. Thus you can e.g. 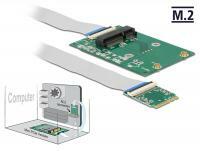 connect SATA SSDs to the M.2 NGFF interface. 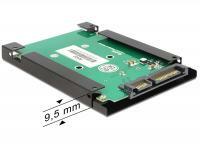 This Delock converter enables you to connect an mSATA SSD in half size format which can be used as a 1.8â³ HDD. 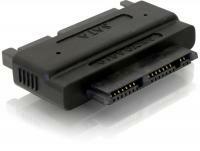 The converter can be installed into your system internally through the SATA 16 pin interface. 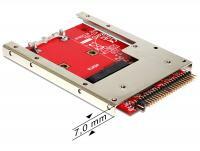 This Delock converter enables you to connect an mSATA SSD in full size format which can be used as a 1.8â³ HDD. 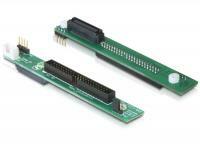 The converter can be installed into your system internally through the SATA 16 pin interface. 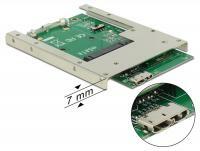 This Delock converter enables you to connect a M.2 NGFF SSD in 2260, 2242 and 2230 format which can be used as a 2.5â³ HDD. 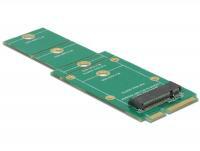 The converter can be installed into your system internally through an SATA 22 pin interface. This Delock converter enables you to connect a M.2 NGFF SSD in 2280, 2260, 2242 and 2230 format which can be used as a 2.5â³ HDD. The converter can be installed into your system internally through an SATA 22 pin interface. 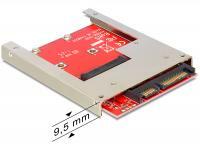 This Delock converter enables you to connect up to two mSATA SSD which can be used as a 2.5â³ HDD. 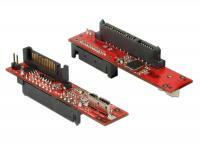 The converter can be installed into your system internally through the SATA 22 pin interface. 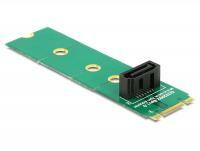 This adapter by Delock converts the M.2 NGFF interface into a SATA 7 pin interface. Thus you can e.g. 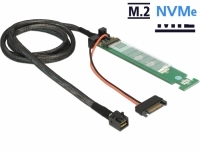 connect SATA SSDs to the M.2 NGFF interface. By the help of the perforation you can reduce the length to 60, 42 or 30 mm. 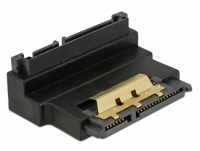 This Delock adapter can be used as a port saver in order to prevent the M.2 NGFF interface from damage when it is under usage for high contact durability. 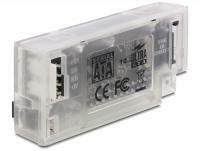 Together with Delock item 62554 the adapter can be used for test purposes that if there is a mistake you can change fast the module. 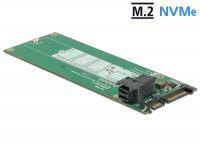 This Delock converter enables you to connect a M.2 NGFF SSD in 2280, 2260, 2242 and 2230 format. 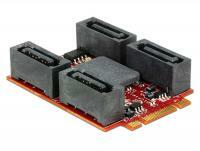 The converter can be installed into your system internally through an SATA 22 pin interface. 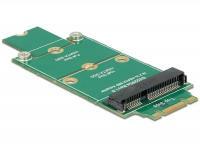 This Delock converter enables you to connect a M.2 NGFF SSD in 2280, 2260, 2242 and 2230 format. 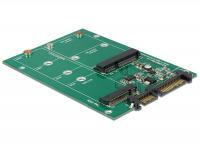 The converter can be installed into your system internally through an SATA 7 pin interface. This Delock converter enables you to connect up to four M.2 NGFF SSDs in 2280, 2260, 2242 and 2230 format which can be used as a 3.5â³ HDD. 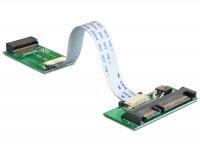 The converter can be installed into your system internally through an SATA 7 pin interfaces, therefor you have to connect one SATA cable with your system for each connected M.2 module. This Delock converter enables you to connect up to four M.2 NGFF SSDs in 22110, 2280, 2260, 2242 and 2230 format which can be used as a 3.5â³ HDD. 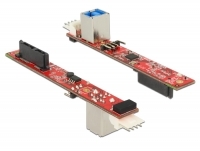 The converter can be installed into your system internally through a SATA 7 pin interface, therefor you have to connect one SATA cable with your system for each connected M.2 module. 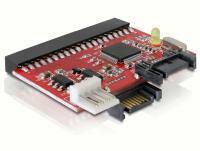 To this Delock adapter you can connect a PCI Express card. The adapter will be connected to your system via the M.2 NGFF port of your system. Through the predetermined breaking point you can cut the length from 80 mm to 60 mm. 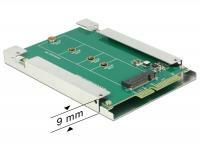 This Delock converter enables you to connect up to two M.2 NGFF SSD in 2280, 2260, 2242 or 2230 format which can be used as a 2.5â³ HDD. 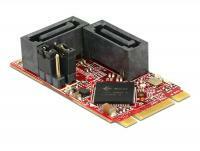 The converter can be installed into your system internally through an SATA 22 pin interface. When using more than one SSD, you have the possibility to use different RAID level. 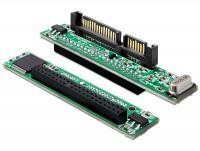 This Delock adapter enables you to connect an mSATA module in half size or full size format. 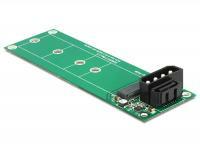 The adapter can be installed into your system through a M.2 NGFF interface. 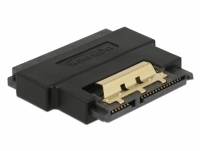 This Delock adapter enables you to connect a M.2 NGFF SSD in 2280, 2260, 2242 or 2230 format. 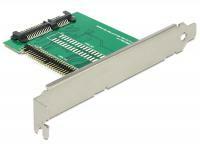 The adapter can be installed into your system through an mSATA interface. 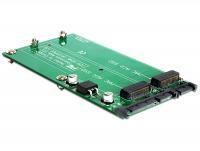 This Delock converter enables you to connect up to two mSATA SSD which can be used as a 2.5â³ HDD. 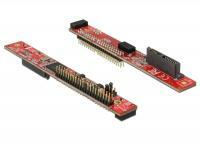 The converter can be installed into your system internally through the SATA 22 pin interface. When using more than one SSD, you have the possibility to use different RAID level. 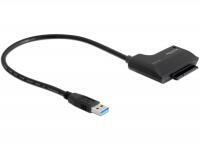 This adapter by Delock converts your internal Mini SAS HD SFF-8643 interface into an external Mini SAS HD SFF-8644 interface and can be build in a PC slot. This Delock converter enables you to connect a M.2 NGFF SSD in 2260, 2242 and 2230 format which can be used as a 1.8â³ HDD. 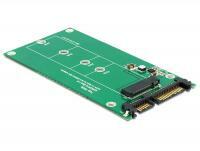 The converter can be installed into your system internally through an SATA 16 pin interface. 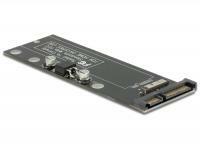 This Delock converter enables you to connect one Blade-SSD (MacBook Air SSD) through the SATA interface to your system. 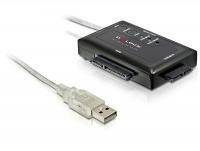 This converter by Delock enables you to connect your optical drive with Slim SATA interface via the USB interface. Therefor you can connect the converter directly to the back side of the drive. 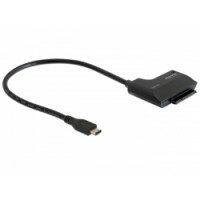 This converter by Delock enables you to connect your drive with SATA interface via the USB interface. 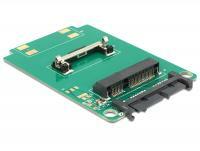 The converter is suitable for all SATA devices, e.g. SSD, HDD, DVD, CD-ROM. 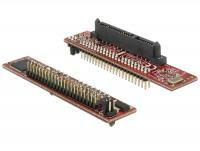 This Delock adapter enables you to connect a M.2 NGFF module in 2242, 2230, 3042 or 3030 format. 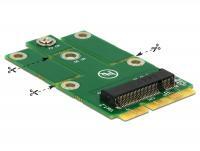 The adapter can be installed into your system through a Mini PCIe interface. Through the predetermined breaking point you can shorten the length from full size to half size. 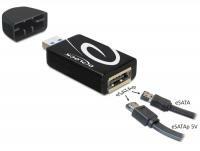 Description This Delock converter can be connected via USB Type-C™ interface to a PC or laptop. 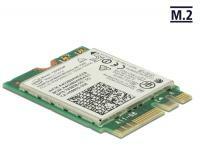 Thus a 2.5″ SATA HDD or SSD with a 22 pin SATA interface can be used. 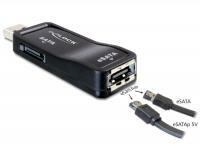 This Delock converter connects up to two mSATA SSD which can be mounted like a 2.5â³ HDD. 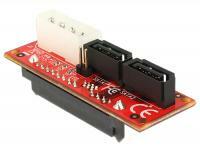 The converter has to be installed into the system through the USB interface. Description This Delock converter enables the connection of up to two M.2 NGFF SSD in 2280, 2260, 2242 or 2230 format which can be used as a 2.5″ HDD. 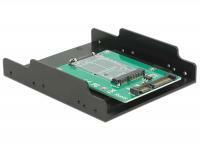 The converter can be installed into your system internally through an SATA 22 pin interface. When using more than one SSD, you have the possibility to use different RAID level. 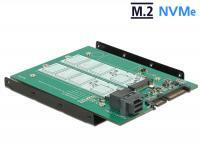 This Delock converter enables the connection of a M.2 NGFF SSD in 2280, 2260, 2242 and 2230 format. 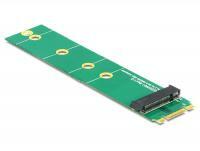 It allows the possibility to connect a PCIe or SATA M.2 SSD. 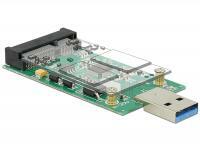 The converter can be installed into your system internally through the SATA 22 pin interface while using a SATA M.2 SSD, or via the SFF-8643 interface while using a PCIe M.2 SSD. Description This Delock converter can be connected via USB Type-C™ interface to a PC or laptop. 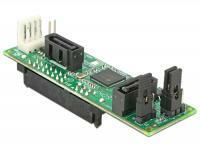 Thus, different SATA devices with 22 pin SATA interface can be operated. 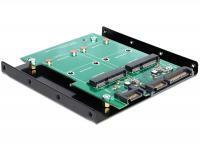 The included power supply can be used for 3.5″ SATA HDDs or optical drives. 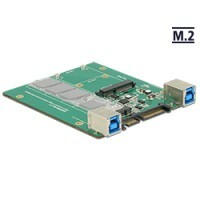 Description This Delock converter enables the connection of a M.2 SSD in 2280, 2260, 2242 and 2230 format or a mSATA SSD in half size or full size format. If both slots are occupied, only the M.2 SSD can be used. 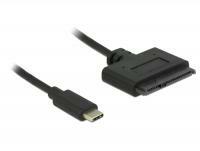 The converter can be installed into the system through the USB interface. 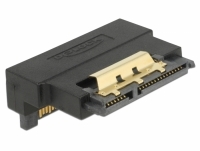 Description This Delock converter enables the connection of a M.2 SSD in 2280, 2260, 2242 and 2230 format or a mSATA SSD in half size or full size format. If both slots are occupied, only the M.2 SSD can be used. 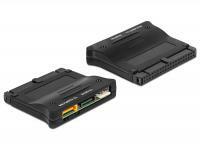 The converter can be installed into the system through a SATA or USB interface. 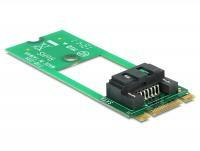 This M.2 module by Delock expands a system by one RJ45 Gigabit LAN port. 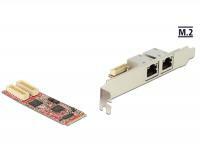 This M.2 module by Delock expands a system by one RJ45 Gigabit LAN port.The module and the RJ45 adapter board are designed for operation in the extendedtemperature range from -40 Â° C to 85 Â° C.
This M.2 module by Delock expands a system by two RJ45 Gigabit LAN ports.The module and the RJ45 adapter board are designed for operation in the extendedtemperature range from -40Â°C to 85Â°C.